Cody formed his body into a championship winning physique by preparing better than the competition. He shows up to win and proves that everything is bigger in Texas! I began working out at age 17 and became fascinated as I saw my body progress. 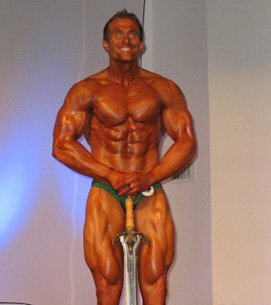 At 19, I decided to try my luck in an INBA bodybuilding show and won the teen division, the novice tall division, and the novice overall division. After the win, my trainer and mentor said I needed to gain size and muscle maturity, so I put off competing for five years. In June, I entered the INBA Lonestar State Natural bodybuilding championship and won the open tall class and the open overall. That earned me a pro card in natural bodybuilding. My passion progressed as my body progressed. When my physique started taking the shape of a bodybuilder I was hooked. What drives me to get better is the fear of losing. Being the best is my primary goal at every show I enter. I never train for second place. The biggest aspect of the sport other than the bulging muscles and ridiculous vascularity is the discipline. Without a positive attitude and extreme discipline, nothing worth having would be possible. 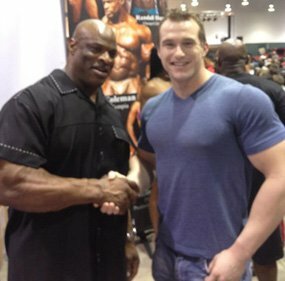 My biggest motivator when it comes to bodybuilding is my mentor and trainer Lon. He's taught me so much and pushed me past my limits. I owe all the trophies and winnings to God and him. The best motivator for inspiration when the gym doesn't look appetizing is watching Rocky IV. Right now, I'm finishing school in the off-season and want to walk on a natural pro stage in the summer of 2014. Most people would say Arnold Schwarzenegger, who I do admire, but my favorite is Frank Zane. Frank wasn't the biggest guy on stage (like me), but he had lines that other bodybuilders couldn't comprehend and his posing was top notch. BodySpace helped me track my measurements and showed how fast I was losing weight during contest prep. The forums are a great resource to find supplements that help lose water weight in the weeks leading up to shows.